Imagine battery acid running through your veins. That’s pretty much what sugar is doing inside your body! Yes, graphic and perhaps a little overdramatic, I know. But sugar is crippling your body in many ways you’ve probably never even considered. 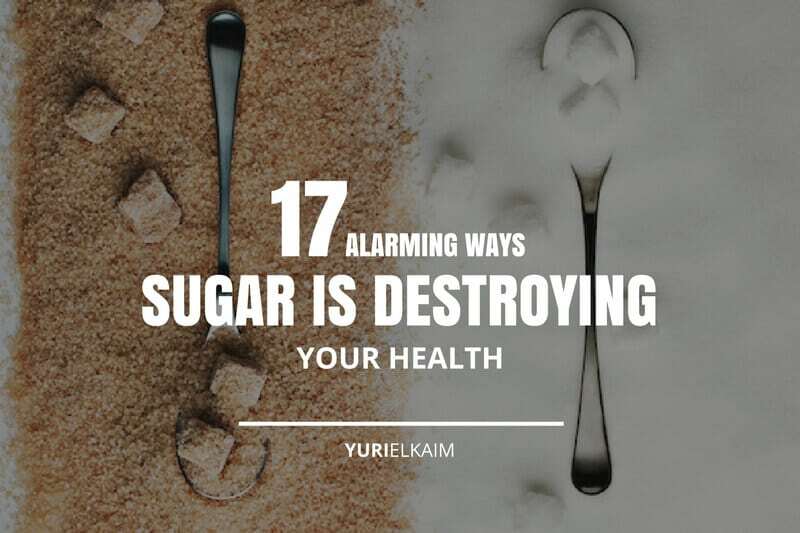 In this post I’ll show you 17 alarming ways you should be aware sugar is destroying your health. The thing is, our love affair with sugar starts off pretty innocently. We might add a teaspoon or two in our coffee, or a scoop or two into our oatmeal. But on top of all the hidden places sugar lurks, it doesn’t take much to go overboard on the sweet stuff. Trust me, I know how hard it is to cut back on sugar (in fact, its addictive quality is on the list below). Most of us are eating double the recommended amount of sugar in a day, and that can add up to a whopping 300+ calories daily just from sugar (1)! But sugar does way more than just temporarily kick up your energy levels and make things taste a little sweeter. It’s harming you from the inside out, affecting pretty much every part of your body and causing serious health problems down the road. But what does sugar do to your body exactly? Let’s look at just a few ways your sugar intake is hurting your health. One of the major negative effects of sugar on the body is its role in insulin resistance. Here’s how it happens: when we eat sugar, our glucose (blood sugar) levels start to rise. Then, our body begins producing insulin to help carry the glucose out of the blood and into the cells. This works pretty well when you’re eating a generally healthy diet. But when you start eating lots of processed foods (like refined grains and sugary baked goods), things get complicated. Because those foods force the body to pump out tons of insulin to keep up with all the glucose in the blood. Eventually our cells become resistant to it and insulin stops working the way that it should. This can lead to some serious complications, like metabolic syndrome, heart disease, and type 2 diabetes (2). Too much sugar has a negative impact on our entire body, but it’s especially damaging to the heart. Triglycerides are a form of fat that we get from eating too many saturated fats, such as refined vegetable oils. But a more pressing concern is the fact that they are also formed when we eat too many calories — especially in from foods rich in sugar. When we eat simple sugars, our blood glucose levels soar. Our pancreas releases insulin to help remove the glucose from our blood. All that extra insulin signals the liver to turn the glucose into triglycerides (3). 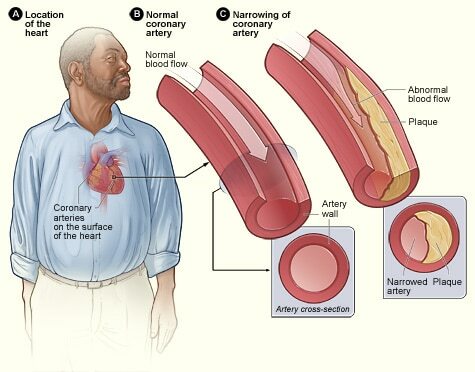 If your triglycerides get too high, it can mean you’re more likely to suffer from heart disease. In fact, a 2014 study found that individuals consuming at least 25 percent of their calories from added sugar were twice as likely to die from cardiovascular disease than those whose diets had less than 10 percent of calories from added sugar. Just as eating too much sugar can cause heart disease, it can also harm your liver. Sugar is actually 50 percent glucose (this what your cells actually use to produce energy) and 50 percent fructose. Fructose is arguably even more devastating than glucose to your health and waistline. But for years, the medical and dietary community has mainly been concerned with the glycemic index (GI) of foods, which only accounts for the glucose-mediated rise in blood sugar after eating a specific food. The glycemic index typically ranges between 50 and 100, where 100 represents the standard, an equivalent amount of pure glucose. A lower glycemic index is ideal since it suggests slower rates of digestion and a muted insulin response. Low–glycemic index carbohydrates include slow-burning foods like beans and legumes, whereas breads and cereals tend to have a much higher glycemic index. It’s no surprise, then, that the latter are more heavily involved in the development of diabetes and obesity. But the trouble with fructose is that it cannot be used by our cells. It must first be metabolized by our liver and converted into glucose before it can be shipped to the rest of our cells to be of any use to us. Here’s the problem: our liver can only process so much fructose at once. It is a rate-dependent process, where any excess ends up being converted into uric acid and triglycerides. Think of it as an assembly line where parts move down the conveyor belt as workers deal with them in a timely fashion. Now, what would happen if the speed of the conveyor belt increased? Obviously, the workers would not be able to keep up and parts would be flying off the belt and piling up on the floor. That’s what happens in your liver when you consume too much fructose. 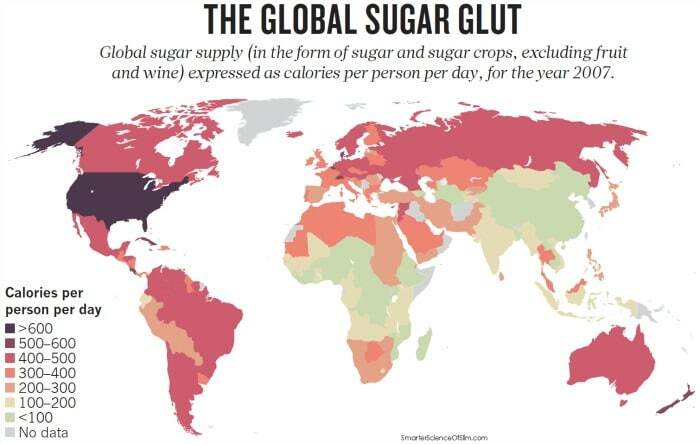 And here’s the worst part — it doesn’t take a lot of fructose to create this problem. Drink a can of soda or a bottled juice, and you’re already there. The only way to avoid this backup and spillover into triglyceride formation is by eating less fructose (ideal), slowing your intake of it, or exercising intensely (which is the only known way to increase your liver’s ability to handle more fructose at once). So, when we eat lots of fructose, our liver is literally forced to use it to create fat. 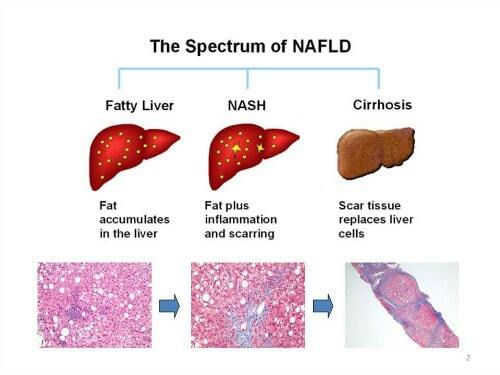 Frequent fructose consumption can lead to the formation of fat droplets in the liver, known as nonalcoholic fatty liver disease (5). This overloads the liver and can lead to chronic fatigue, abdominal swelling, and even jaundice. Worst of all, it can even progress to more severe forms of liver disease if left untreated (6). Too much sugar can really start to weigh you down — literally. Most sources of simple sugars are considered “empty calories.” Unlike foods like fruits or vegetables, which provide tons of fiber, vitamins, and minerals, sugar doesn’t really add anything to the diet … except for calories. This means that instead of eating foods that promote satiety and keep you feeling full, you’re just eating to add extra calories to your diet. Not ideal. And as you can imagine, this can lead to weight gain pretty easily. One study even found that kids who drink the most sugar-sweetened beverages were 55 percent more likely to be overweight or obese compared to kids with the lowest intake (7). Sugar feeds all the cells in our body, including cancer cells, and there’s plenty of evidence suggesting that piling on the sugar could actually be causing certain types of cancer. Research has found that excess sugar intake is linked to pancreatic cancer, breast cancer, colon cancer, and liver cancer (8, 9, 10, 11). Although the way it works isn’t totally clear, it’s thought that the impact of high sugar diets on triglycerides, glucose, and insulin could play a role as could the effect on certain metabolic pathways that cause cancer cells to spread (12). For instance, cancer cells use sugar like a sports car uses gasoline — it depends on it to burn faster, to grow, and to multiply rapidly. In cancer cells, glucose accelerates cell division in what is known as the Warburg effect, based on the Nobel Prize winning research by Otto Warburg in 1931 whereby he showed that cancer cells thrive in the absence of oxygen where this is more sugar present. New research shows that in one in four human tumors, there is an excess of glucose receptors in the external face of the cell membrane and this protein acts as a magnet attracting all the glucose from the bloodstream. Regardless, it’s pretty clear that sugar should definitely be limited in a cancer-prevention diet. 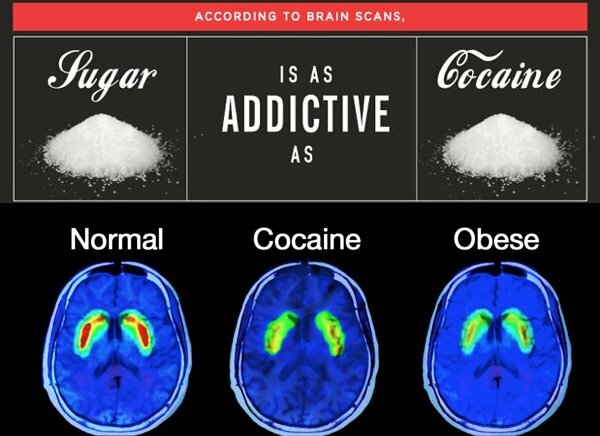 You might have heard about the effects of sugar on the brain, but did you know that sugar addiction is pretty similar to drug addiction? It’s shocking but true. When we eat sugar, our brain releases a burst of opioids and dopamine, undergoing the same neurochemical changes that occur with addictive drugs (13). Researchers have even found that the same medications used to treat nicotine addiction can also be used to treat sugar addiction (14)! High uric acid levels can be a major risk factor for heart and kidney disease — and loading up on the fructose is often to blame. As we saw earlier, when we eat fructose — which is found in table sugar, fruit juice, and high-fructose corn syrup – it undergoes a process that ultimately converts fructose to uric acid. The connection between fructose and uric acid is so strong that increased levels of uric acid can actually be used to indicate fructose toxicity (15). Advanced glycation end products — appropriately known as AGEs — can cause skin to become dull and wrinkled fast. 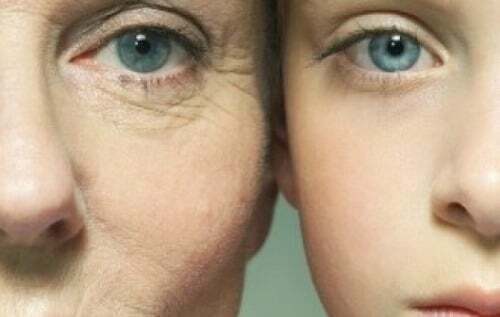 AGEs are formed through a process called glycation, when proteins and fats are exposed to the sugar in your bloodstream. This causes damage to both collagen and elastin, accelerating the aging of your skin and causing it to lose its firmness and elasticity. The more sugar in your diet, the more AGEs you’re accumulating — and the faster your skin is aging. You’ve probably heard of free radicals before: dangerous unpaired electrons that can wreak havoc by causing inflammation, cancer, and chronic disease. They’re definitely not something you want in your body, much less coming from your diet. Unfortunately, a diet rich in sugar actually promotes free radicals in your system. Excess sugar in the bloodstream harms the body in two ways: it causes the formation of free radicals and also lowers antioxidant levels in the blood (16). The best way to fight free radicals? Cut the sugar and load up on healthy antioxidant-containing foods to improve your overall health. There’s a reason you probably don’t feel super satisfied after indulging in a high-carb, high-sugar snack, and it has to do with your hormones. Two main hormones are responsible for letting us know when we’re hungry and when we should stop eating. Ghrelin, the hunger hormone, increases appetite and signals to us that it’s time to eat. 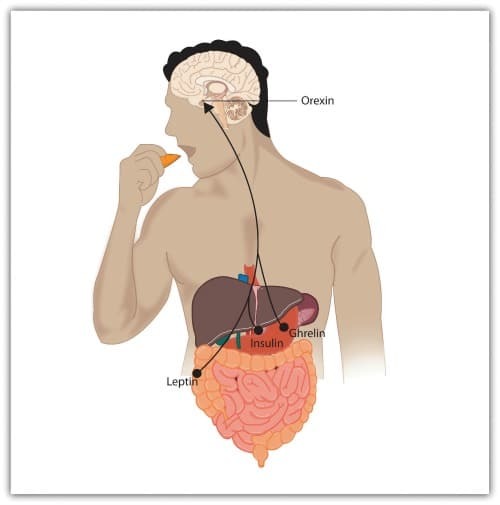 Leptin, the satiety hormone, does just the opposite by turning off hunger when we’ve had enough. But when we eat lots of fructose this appetite control system doesn’t work the way it’s supposed to. Ghrelin isn’t suppressed and leptin isn’t stimulated. The result? You can eat plenty of fructose but never feel full. This can lead to overeating and, inevitably, a few extra pounds (17). We’ve all been lectured at the dentist office one time or another about flossing more often and cutting back on the sugar to prevent cavities. But did you know that sugar is actually the only cause of tooth decay? And given the increase in sugar consumption in recent years, it’s not all that surprising that approximately 92 percent of adults in the US have experienced tooth decay (18)! Compare that to people living in Nigeria; with almost no sugar intake, only 2% of people in Nigeria have experienced tooth decay. The best way to protect your teeth from the side effects of too much sugar is to eliminate it from your diet. Our diet plays a massive role in our brain’s structure and function. Researchers have found that eating a diet high in fat and refined sugars decreased the level of brain-derived neurotrophic factor (BDNF) in the brain, which is involved in the formation of memories and is usually affected early on in the development of Alzheimer’s (19, 20). It’s no secret that eating too much sugar can eventually lead to diabetes. In fact, it’s probably one of the most well-known side effects of eating too much sugar and also one of the most serious. Chronic sugar intake can cause insulin resistance, which keeps your blood sugar high and puts you at risk for developing diabetes. Left uncontrolled, diabetes can take a toll on your eyes, nerves, teeth, kidneys, and heart, plus put you at risk for developing lots of other diseases too. The American Diabetes Association recommends nixing sugar-sweetened beverages from your diet and moderating your intake of sweets to minimize your diabetes risk. Ever feel sluggish and tired after devouring a sugary snack? You can thank all that added sugar for that. Orexin cells, which are responsible for keeping us awake and energized, are suppressed when we eat lots of sugar. When these cells aren’t working at their best, it can make us feel sleepy and drained, hence that post-food coma you might find yourself slipping into after a big, sugary meal (22). Sugar is incredibly harmful to our body, right down to our very bones. One animal study found that following a high carbohydrate diet actually led to bone disturbances and had an osteoporotic effect. Plus, those AGEs formed by sugar don’t just age your skin — they also age your bones. The buildup of AGEs is one of the main reasons people with diabetes have an increased risk of bone fracture (24). If you’ve never experienced a flareup of gout, count yourself lucky. This incredibly painful condition occurs when uric acid builds up in the blood and causes solid crystals to form in the joints. Intense joint pain, swelling, stiffness, and redness are just a few of the common symptoms you can expect with a gout attack, but it’s all pretty controllable with a few lifestyle modifications. One of the best ways to prevent uric acid build up and skip the gout flare? Decreasing your intake of sugar — and especially your fructose intake. Remember how I mentioned that sugar can cause your triglycerides to skyrocket? Well, that’s not the only effect that a sugary diet can have on your heart. Believe it or not, some experts are now saying that sugar is actually worse than salt when it comes to hypertension. A diet high in added sugars — and especially fructose — could be to blame for increases in blood pressure, forcing the heart to work even harder to pump blood throughout the body (25). Convinced? Ready to stop sugar in its tracks and become a healthier you? Start building up the rest of your diet with healthy ingredients like fruits and vegetables, drink plenty of water, and download your FREE copy of my Craving Cure, which will help you kick your sugar cravings to the curb by this time tomorrow – seriously. Click the banner below to download it right now.